Those who’ve spent much time watching jittering Lego blocks on YouTube, Wallace and Gromit shorts on an iPod, or recent Tim Burton animated films in the theater know that stop-motion movie-making is a going concern. For those unfamiliar with the term, stop-motion animation is the painstaking process of capturing still images of a scene, moving objects within the scene ever so slightly after each still image capture, and stringing together the resulting images as video frames so that when played back they mimic movement. Unlike in the golden claymation days of Gumby and Pokey, creating stop-motion videos is well within the grasp and budget of the typical Mac user. With little more than a digital camera or camcorder, software, and a fair measure of patience and planning, you can create a compelling animated feature. Here are some suggested ways to go about it. Camera You can’t very well capture still images without a camera. Although you could conceivably use your Mac’s built-in iSight camera, you’re far better off with a real camera that captures higher-quality images. This can be either a digital still camera or a camcorder. Which you choose largely depends on the software you use to assemble your animation. If you use a traditional movie editing application such as iMovie ’09 ( ), you’ll use a still camera to capture your images, import them to your Mac, and add them to an iMovie project. Applications designed specifically for stop-motion animation can not only import images shot with a still camera (some can capture live images directly through the camera) but also capture images from a camcorder tethered to the Mac via USB or Firewire. If you have the option, a good still camera will produce better images than a typical consumer camcorder because of the camera’s better sensor; you get greater control over focus, aperture, depth of field, and white balance, and the variety of lenses you can use. Software As stop-motion animation is little more than still images pieced together in a sequence, you can create a movie with any video application you like. And, for Mac users, that generally means iMovie ’09. However, while iMovie ’09 is affordable (particularly if it was bundled with your new Mac), there are tools better suited for the job. Philipp Brendel’s free FrameByFrame is a bare-bones stop-motion animation application that works with a DV camcorder or iSight camera. It supports a form of onion skinning—a feature that displays a semi-transparent overlay of the last frame you shot along with the image of the object currently in front of the camera. Using onion skinning you can see how much you’ve moved the object in relation to its last position, thus helping to ensure that the movement between frames is neither too minimal or radical. FrameByFrame doesn’t support still cameras nor can it import still images. Boinx Software makes three flavors of its capable stop-motion animation application, iStopMotion 2—Home ($49), Express ($99), and Pro ($499). The Home version lacks support for rotoscoping (used for lip syncing dialog) and soundtracks, and doesn’t allow continuous recording (shooting a user-defined number of frames or seconds of video) or offer noise reduction. Like the Home version, iStopMotion 2 Express doesn’t support HD video or provide integration with Final Cut Pro ( ). All versions include onion skinning, allow you to use both camcorders and supported still cameras, and include a compositing feature for adding background images and foreground frames. Boinx's iStopMotion 2 includes a compositing feature for applying foreground and background images. 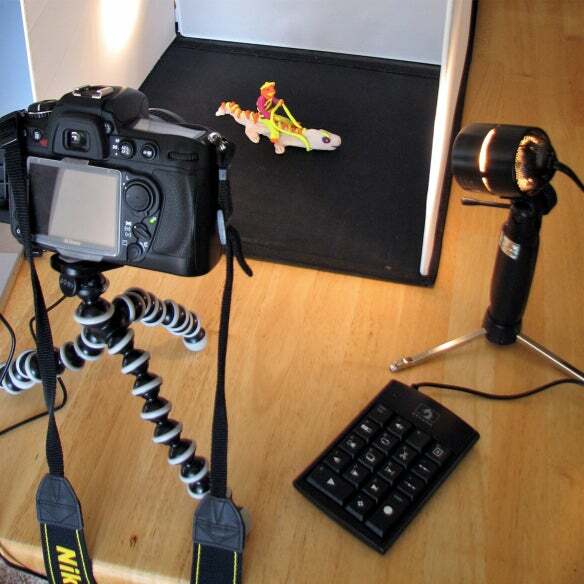 D-Zed’s $275 Dragon Stop Motion is a professional stop-motion animation application. Although it can use camcorders for capturing images (including HDV/HDMI cameras in league with an HDMI conversion card), its strong suit is its support for still cameras. With it you can use the Live View feature found in recent Nikon, Canon, and Olympus DSLRs to not only preview shots through the camera’s lens, but also capture high-quality images. iStopMotion 2 also supports some DSLRs, but not as many as Dragon Stop Motion. It also includes such worthwhile features as onion skinning, an X-Sheet window (a technical script template) for plotting and annotating your shots, support for RAW camera files, and a dialog track for typing in phonetic symbols to help sync audio and motion. Onion skinning as seen within Dragon Stop Motion. 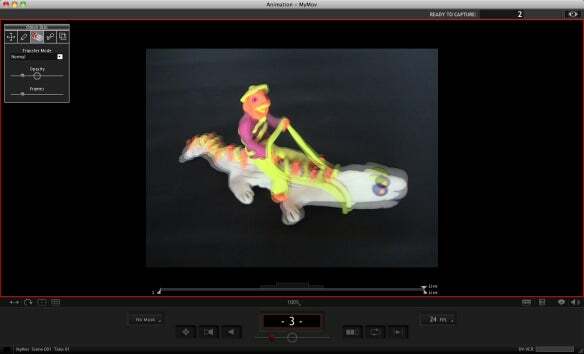 FrameByFrame, iStopMotion 2, and Dragon Stop Motion let you trigger your camcorder and—in the case of the latter two applications, supported still camera—via the Mac’s keyboard or remote control. 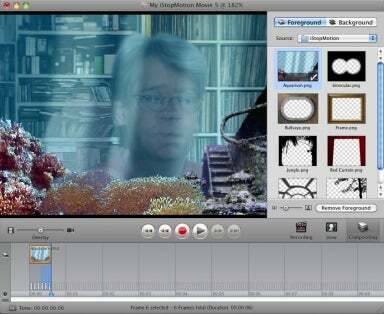 iStopMotion 2 additionally lets you use Apple’s hardware remote control (with Macs that support it) to trigger captures. D-Zed includes the Dragon Stop Motion Controller—a wired USB keypad—for controlling the software and performing camera captures. Both iStopMotion 2 and Dragon Stop Motion support time-lapse shooting, provide an on-screen grid so you can more carefully design your shots, and include a feature for adding and offsetting soundtracks. Accessories A camera and the right software can be enough to get you started, but you’ll create better-looking projects with a few additional items. Start with a tripod. It’s vital that your camera stay in one place when you shoot a scene and a tripod can provide that service. If you’re animating small objects—clay figures, Lego, or toys—a desktop tripod will often do the trick. Lights are another useful addition. Light changes over time and if you don’t control your primary light sources the quality of light within each shot will vary, making for an uneven looking video. You can inexpensively light your sets with a couple of tungsten work lights from your local Home Depot or Lowe’s. To cut down on harsh shadow, diffuse that light with a white bed sheet, white shower curtain, or sheet of diffusing material found at a photographic supply shop. Alternatively you can use a couple of table lamps with daylight bulbs or purchase a small-object lighting kit such as American Recorder’s $130 Studio in a Box. Whether you choose work lights, daylight bulbs, or the lights in a lighting kit, adjust the white balance on your camera to find the setting that works best with the light you use. Your stop-motion video will be mighty dull if you put nothing more interesting than a bare wall in front of the camera. Fortunately, you can animate just about anything. Traditionalists will turn to modeling clay. It’s inexpensive and easily shaped. If you choose clay it’s a good idea to wrap it around a wire armature (skeleton). Tall clay objects tend to bend of their own accord (particularly when the clay is warm) and you don’t want to constantly twist something back into the correct posture between shots. The wire helps objects stay where you put them. You’re welcome to make your own but you can also purchase armature kits and parts from such companies as Animate Clay, Animation Supplies, Armaverse, and Skeletoon. Additionally, you can place small magnets in the feet of your armature and a thin steel plate in the stage’s floor to anchor your models. Pre-made armature from Animation Supplies. When creating clay creatures that talk or use facial expressions, consider creating multiple parts—mouths, eyes, even heads—and swap them in when needed. For example, if your clay character speaks, you can form mouth parts that accompany “oo,” “ah,” “ee,” and plosive sounds (b’s and p’s). Record your dialog and then place the appropriate mouth shape to align with that dialog. Again, both iStopMotion 2 and Dragon Stop Motion include audio tracks for adding dialog. Another popular medium is Lego blocks and characters. Lego offers a lot of advantages as it’s a relatively inexpensive material; there are a wide variety of shapes, pieces, and characters; you can work on a small “stage;” base plate pieces provide you with a “floor,” making it easy to attach your characters to a predictable surface (one where you always know where to place the characters’ next step); and because Lego is so recognizable, your audience will expect the animation to be a little wooden (and without animated expressions on the characters' faces). If you’re a doodler, give paper and drawing or painting materials a try. Though some may define your effort as closer to a cartoon than stop-motion animation, the results can be spectacular (and inexpensive to produce). Your subject need not be inanimate. Humans prove to be a perfectly good subject for stop-motion animation not only because they’re flexible in so many ways, but because you can tell them how to move. YouTube is full of stop-animation videos that feature human subjects. Although you can set up a camera, launch a stop-motion animation application, and start shoving Polly Pocket figures around on the dining room table, your video will be more compelling with some scenery and a story line. Scenery will be determined by both the characters’ materials and their size. Human subjects are best shot in the real world. Clay characters can interact with the real world or be confined to a set you construct. Unless you have a lot of Lego, you’ll use a small set, much of which you can make out of Lego blocks. When constructing a set, it’s worth the effort to create walls on the sides and back. This provides surfaces to bounce light off of and will lend depth to the scene when you place objects in the background. Additionally, you can line those surfaces with green paper or cloth, providing you with a green-screen background on which you can overlay pictures or movies in a video editing application that supports green screening. A simple setup with stage, figure, lights, camera, tripod, and controller. You should also prepare a shooting script. Having a script in hand will not only ensure that you’ve thought through your story before you start shooting, but it will help you plan your shots. Look at any modern TV show or movie and you’ll find that the camera doesn’t linger on a character or angle for more than a handful of seconds. Your movie will look more professional when you shift angles every so often or move between long, medium, and close-up shots. All these movements should be planned and written out in a script that contains columns for action, dialog, camera position, and technical notes (“light from below,” for example). When shooting from multiple angles and distances, you’ll find it easier if you use more than one camera. With multiple cameras you can leave each in place. With one camera there’s the danger that when you move it, you’ll be unable to return it to the exact position it was in originally. If you have just the one camera, carefully mark the position of the tripod—both where its legs stand and its height—so you have a better chance of putting it back in its original position. If your video includes dialog, record it before you start capturing images. That way you can accurately form the character’s lips and mouth to match the words it speaks. Even if you’re animating Lego or stuffed animals—where moving mouths isn't a concern—you’ll find it much easier to pace your movie if you edit it to the dialog. Shooting first and then trying to cram the dialog into the correct spots can make the dialog sound unnatural. You have more leeway with sound effects. With an audio editor that supports QuickTime (GarageBand, for example) you can easily add, edit, and position many sound effects after you’ve assembled the video. Before you take your first shot you have some important questions to answer: How smooth do you want the motion to be? How long do you intend the video to be? How much time and patience do you have? And how clearly have you observed the movement of “real” objects? Considering frame-rate Motion pictures are shot at 24 frames per second (fps). Full-motion video is approximately 30 fps. The Wallace and Gromit 30-minute shorts were shot at close to 20 fps—around 35,000 shots per video. That’s a lot of pictures. Unless you’re a professional with a staff to do the grunt work or have nearly endless amounts of time on your hands, you need to find ways to take fewer shots. One way, obviously, is to make shorter videos. Another is to choose a lower frame rate. 15 fps looks reasonably smooth, but that’s still a lot of pictures. Because viewers expect stop-motion animation to be jerky, putting together a movie at 10 or 12 fps is hardly a sin. If you’re importing images into iMovie ’09, you don’t have much choice as the shortest value you can assign to a still image is 0.1 seconds. FrameByFrame, iStopMotion 2, and Dragon Stop Motion, however, allow you to set the frame rate you like. Power Whether you use a DV camcorder or DSLR, your camera will be switched on for long periods of time, which will drain the battery and eventually leave you in a powerless lurch. You’ll be able to shoot as long as you like if you forego the battery as a power source and instead attach an AC adapter to your camera. Also, if you use a DV camcorder, that camcorder may go to sleep after a few minutes of inactivity. You can often prevent this by taking the tape out of the camera.